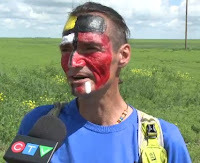 Brad Firth aka Caribou Legs is on the final leg of his 7,400 km cross-Canada run raising awareness for murdered and missing indigenous women and children. Crossing on last night's ferry he will now start across NL so keep an eye out for him and join him for a few kilometers! Read more in THIS CBC STORY and follow his journey on THIS FACEBOOK PAGE.